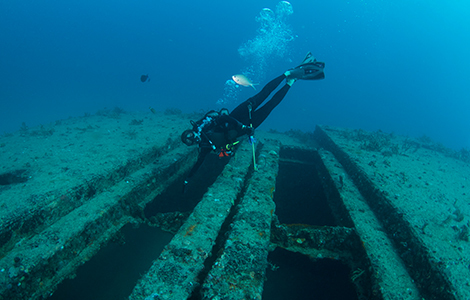 The Sea Emperor was formerly a hopper barge that was donated as part of a fine levied on a dredging company that destroyed some reef habitat off Palm Beach County. She was filled with large concrete culverts and then sunk off Boca Raton. When the barge sank it flipped, scattering the culverts and landing upside down creating a fantastic playground for fish and divers alike. The Sea Emperor is 171' long and 45' wide. Penetration on this wreck is safe, there is light and access to surface in every chamber. 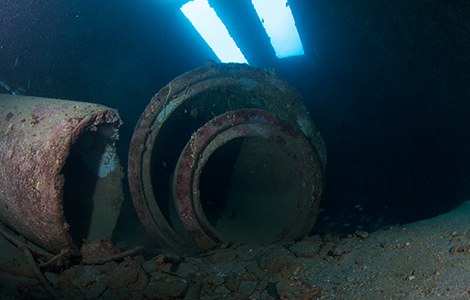 Inside the wreck and to the east lie 1600 tons of concrete drainage culverts. This site is also referred to as the “Aqua Zoo” because it is home to Goliath Groupers, moray eels, southern stingrays, nurse sharks and hundreds of other fish. 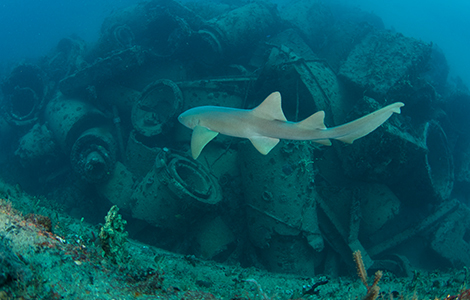 Just 300 feet to the south of the Aqua Zoo lies the United Caribbean wreck. 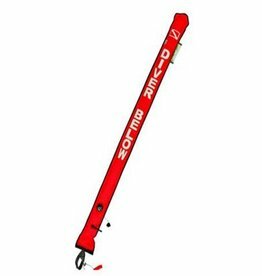 You can easily follow a trail of rock and coral between the two wrecks and make this dive a two wreck dive.